Having a Backup is a matter of great importance. Just recently GitLab reminded us that mistakes do happen sometimes. We, as a service, couldn't afford to lose any clients data, so we have always had internal disaster recovery backups of all the data on our servers, but we felt that this wasn't enough. We wanted to give our clients the ability to be in control of their database backups and also the ability to quickly restore them if necessary. This is the reason why we are rolling out our new feature - Automatic Database Backups. You can activate your Database Backups through your app's dashboard under Automatic Database Backups menu. After the activation, this will be the place where you can find the list of all your backups and choose one to restore if necessary. 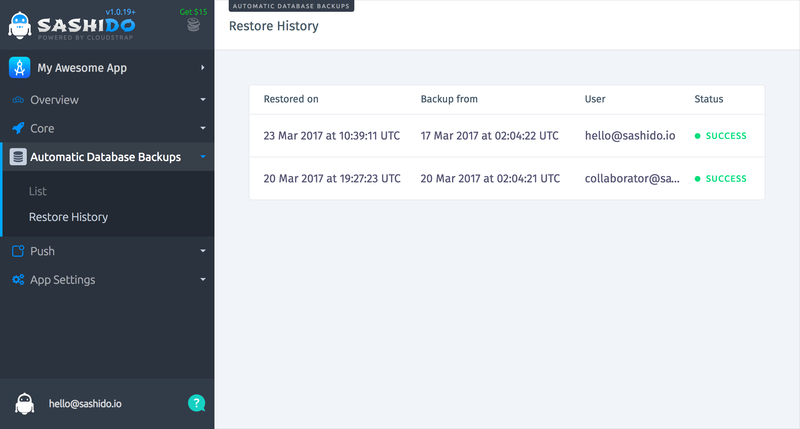 Тhere you can also see your Restore History as list of all restored backups, containing the date of the restoration, the date of the backup restored and the collaborator who restored it. If you wish to deactivate the service, you can do this in App Settings -> Automatic Database Backups. We do keep backups of the entire system, so in case you need us to restore something, we'll start the restore immediately. However the restore process can take from a couple of hours up to 48 hours depending on how big the database is. On the other hand with the Automatic Database Backups restore, the process will be a lot more quicker. So in urgent situations, especially when you have a production app used daily by hundreds and thousands of people you will definitely appreciate if you can have your content restored as soon as possible. There are many cases when our customers contact us and explain how a member of their team working on the project has deleted an important row in the database. Very often such cases happen if a couple of people are managing the same project and especially when there is a new employee. So the Automatic Database Backups will give you a piece of mind that if something like this happens, you can recover your data within a few clicks. The Automatic Database Backups not only have a restore option, but also a backup download button which means that you will be able to download your backups locally and review the info they contain. This way you can for example restore just a specific collection or a single record and not the entire database. Another cool thing about the Automatic Database Backups is the Restore History you will have access to in the Dashboard. You will be able to keep track of who has performed a restore and when. Last but not least, the Automatic Database Backups will save you time- you will not have to worry about keeping manual backups- everything will happen automatically for you. Check out our updated F.A.Q. Page for more info and if you have any other questions, you can contact us at support@sashido.io or via our live chat.